GIFA, in association with the Hindustan Times, is helping a lot of kids nurture footballing dreams. The fourth season of SARE Homes Hindustan Times Great Indian Football Action (HT GIFA), India's biggest neighborhood football tournament for kids kick-started on Saturday in the gracious presence of the Khiladi of Bollywood, Akshay Kumar at Thyagaraj Stadium. The event was attended by the over 5000 players from participating teams of the tournament along with their family and friends. Hosted by famous Indian TV actor Rithvik Dhanjani, the event witnessed an enthralling performance by Zenith Dance troupe and Band Astitva. Great Indian Football Action (GIFA), the annual inter-locality football tournament, organized by the Hindustan Times has successfully nurtured the young and aspiring talent at the grassroots level since its inception in 2014. Following the format of previous three editions, HT GIFA 2017 is divided into several phases, including the registration of teams in two categories - Junior (classes 5th-8th) and Senior (classes 9th-12th). Prior to the opening ceremony, the tournament has already witnessed 316 pre-qualifier matches. The voting leg of GIFA, which gave losing teams from pre-qualifiers a chance to get entry back in the main tournament via wildcard votes garnered a massive 1.96 lakh votes. With 2500 teams, as many as 25,000 kids across Delhi, Noida, Gurgaon, and Ghaziabad have registered for HT GIFA Season 4. A total of 346 teams will participate in league matches in a knockout format with 7 players each side, which begins from September 30th to October 8th. The winners of the tournament will be awarded cash prizes, trophy, medals and exclusive LaLiga merchandise at the closing ceremony of HT GIFA at CWG Village Sports Complex, New Delhi on 8th October. 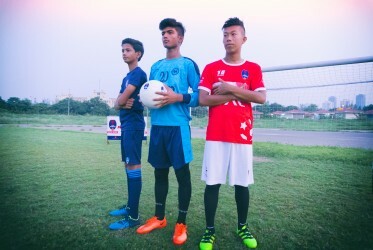 From the participation of 50 teams in Season 1 to 2500 teams in Season 4, HT GIFA has been gaining popularity amongst kids in the area of sports. Emphasizing on the significance of fitness, HT GIFA encourages kids to follow the fitness regime to stay fit through sports in the fast developing world of technologies. HT GIFA gives the platform to aspiring football players to train under the best football coaches within proper infrastructure and attain fame and recognition for their talent.